In 2008, young voters, or millennials, came out to the polls in full force, with 66% of them casting a ballot for Barack Obama. Millennials, or the demographic group succeeding Generation X, now makes up an integral voting bloc, and their tendency to vote along Democratic lines shows “a significant generational shift in political allegiance is occurring,” Pew reports. What are the tendencies of millennials voters? What motivates them to vote? Where do millennial voters get their information and news? 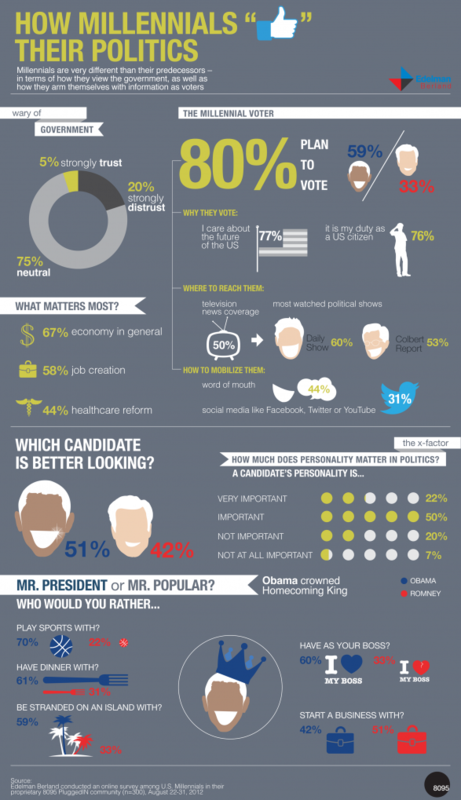 Using information gathered by the marketing research company Edelman Berland and posted on visual.ly, the infographic below provides key information on the demographic of voters that may decide the election this November. Are you a millennial? How do you get your election information?